It's been a super long time since I last participated in a blog event. I was blog hopping and chanced upon some events and thought, hey, why not participate in one? One of them is Sugar High Fridays (SHF). It was first started by Jennifer of The Domestic Goddess. This month, SHF is hosted by Aparna of My Diverse Kitchen and the theme is Bite Sized Desserts. I havent been too productive in the kitchen of late and so I thought I'd use one from my archives (yes! SHF allows archived posts). For this submission I have to ensure it's vegatarian as Aparna writes a vegetarian blog. 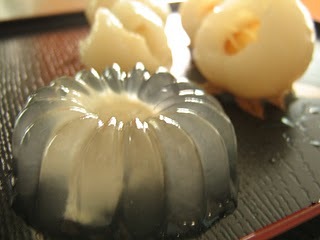 So here's my submission .. Lychee Konnyaku Jelly. Put half a lychee in each konnyaku jelly mould. In a pot, mix the jelly powder and sugar together. Pour in 950 ml water. Switch on the flame, stir until the water starts to boil. Switch off the flame and keep on stirring for about 5 min. Pour the Konnyaku mixture into the jelly moulds. Chill to set for about 3 hours. Click here if you want to read more about konnyaku. I have never heard of this jelly till now. I always thought the only alternative to gelatine was agar. Thanks for sending this to SHF: Bite Size Desserts. Thanks for hosting Aparna. Cant wait for the roundup!